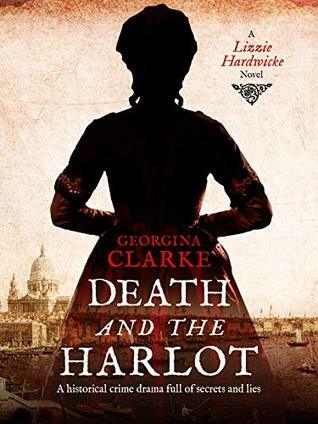 I was lucky enough to be accepted for an advanced ebook copy of Death and the Harlot by Georgina Clarke from Netgalley. This book comes out 13th May 2019 and I would definitely recommend it! Death and the Harlot is set in Victorian London, which is honestly the best setting for a historical mystery. Our protagonist, Lizzie Hardwicke, embarks on an adventure to clear her name of murder. Lizzie was a pleasure! I loved that she made the best of her situation and wasn’t ashamed of herself or the other girls that she worked with in the brothel. It wasn’t the life she chose, but she’s doing the most with the life she has. I also appreciated that we saw Lizzie actually do her job. It makes Lizzie’s character stronger and we can truly appreciate her struggle and understand her actions more. Especially in regards to the other girls and the men she comes into contact with. And talking of men, the Bow Street Runners are a part of history that is fascinating. And adds a fun dynamic as our characters are not from the most respectable parts of London, nor of the most respectable occupation. William Davenport is a rather stereotypical “mysterious” man, who has a heart bigger than he shows. However, I fell hook line and sinker! And I really enjoy the dynamic of Lizzie and Will. I’m looking forward to seeing where this relationship goes and I expect, and hope for, a lot of bickering along the way. The murder mystery element kept me on my toes for the majority of the book. There were a host of characters that were all connected to the “victim” in some way and I, at one point or another, thought they were guilty. I would make an awful detective. The actual resolution was laced through the story so well looking back retrospectively. There are grammatical and spelling errors, but hopefully, this will get proofread again before the final copy goes out to print. Lizzie seemed somewhat useless in parts of the book, especially at the beginning. I will say this gets much better, but I wish we could have gotten a steadier progression, than what felt like quite a quick transformation and “eureka” moment at the end. All in all, I am so excited to see what the future has in store for Lizzie Hardwicke. As well as being excited to see what Georgina Clarke has to bring to the table! Once again, the Death and the Harlot comes out 13th May 2019. If you’re a fan of fun historical murder mysteries, Lizzie Hardwicke is a name you’ll want to watch out.